THE number of people gaining forklift licences has jumped, indicating many are trying to combat the skills shortage. Daniel Hodgetts, 22, hoped these extra qualifications would help him secure a job in the mines. He completed forklift and elevated work platform licences through Industry Training Queensland and is waiting to hear back about a job at Cannington mines. ‘‘Most of what we were taught was about safety and it’s always good to learn more.’’ Mr Hodgetts said he would do anything to make his resume look better to a prospective employer. He also encouraged anyone considering training courses to go for it. Industry Training Queensland trainer/assessor Barry Short said it was encouraging to see the number of people wanting to learn a new skill. ‘‘We get people who have never been on a forklift before who are a bit scared but you keep them going and they get better,’’ he said. ‘‘It’s not a matter of working at speed. You need to go at a slow and steady pace. ‘‘Nowadays you need that certificate to say you can operate a machine.’’ The participants are taught how to load and unload a truck using a forklift as well as safety components and they have to complete a questionnaire. ‘‘What we do in training is realistic to what sort of work they will be doing in the real world,’’ Mr Short said. Industry Training Queensland sales and marketing manager Michael James said due to demand they had doubled the number of forklift classes they offered. ‘‘I think people are concerned with the loss of jobs and upskilling themselves to get a better job, or to hold on to a job, seems like the right thing to do,’’ he said. 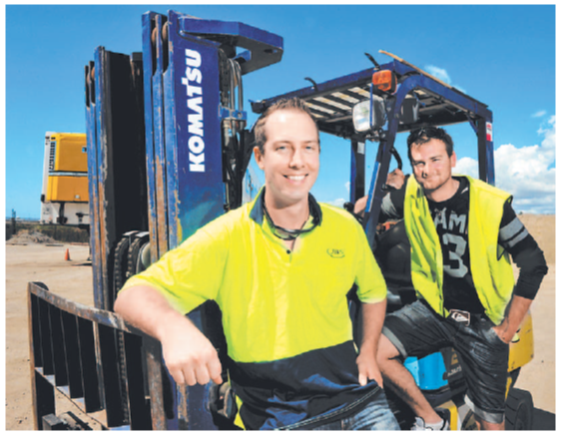 The number of people enrolled in forklift courses had increased over the past six to eight weeks. Elevated work platforms, dogging tickets and truck licences were also popular.